The Authorization to Start Work form is used to notify the company that the contract and proposal has been accepted and they have permission to start work. This Authorization to Start Work is included in editable Word format that can be customized in Word or by using the included Wizard software. How do you write a Authorization to Start Work document? Phone: Phone Number DATE: Current Date. Order #: Work Order Number. Contract ID: Contract Reference Number. City, State Zip or Postal Code. General Description of Project Deliverables. I authorize Company Name to start development of the project as of Current Date. I understand the estimated end date will be End Date. Company Name is authorized to bill us according to the contract payment terms as agreed by both parties. I understand that the project will be started after the authorization has been received by Company Name. The contract is usually negotiated and signed separately from the proposal document. The information contained in your proposal can also be considered part of the contractual agreement, so make sure your contractual agreement matches the information you have included in the proposal. This is only an authorization to start work: this template is not meant to include the entire terms and conditions of your contract. 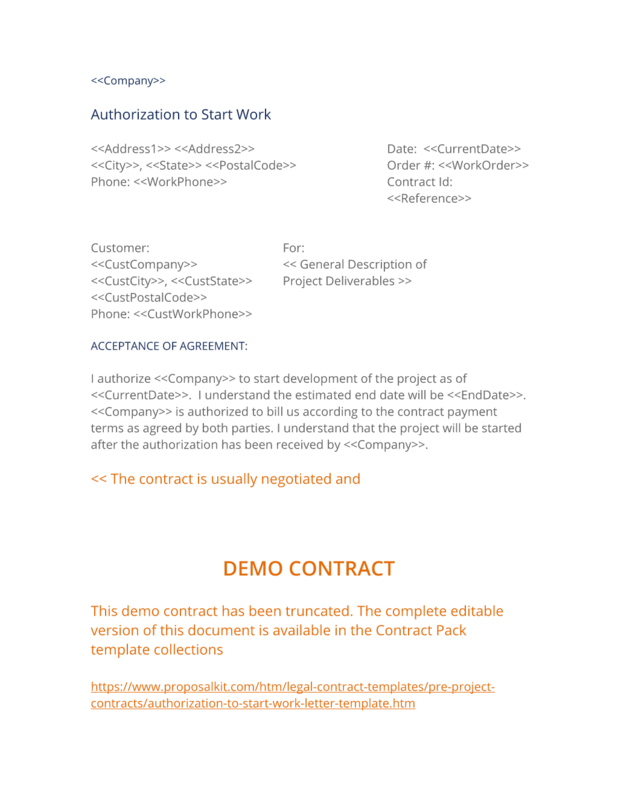 The complete Authorization to Start Work - with the actual formatting and layout - is available in this Contract Pack.